In ancient mythology, there is a magical bird who burned and was reborn from the ashes. The Phoenix. Maybe you know the story? 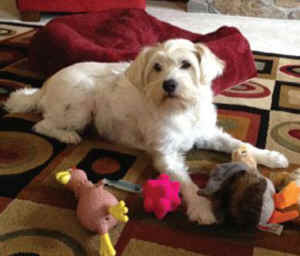 At IDA we have a Phoenix too - she is a little dog our members ask to hear about more than any other. And when I received an update recently, I knew I had to share it with you. Let me start at the beginning... because you need to see the amazing work you keep alive for abused, abandoned and exploited animals each time you give to In Defense of Animals. Our eyes widened when we saw her wounds. 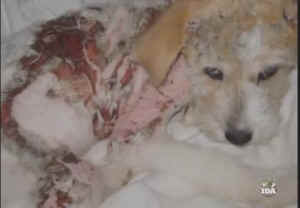 It looked like a pack of wild animals - coyotes perhaps - had savagely attacked this helpless pup with the feathery Disney eyelashes. In a flash, our veterinarian from Mississippi State University (who, fortunately, was already on site performing spay/neuter surgeries) went to work. What he found was far worse. 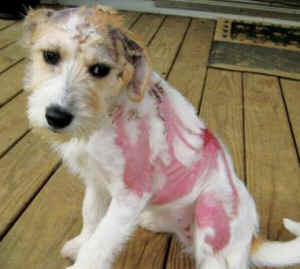 A terribly disturbed human being had intentionally poured BOILING WATER on this sweet dog’s head. Like molten lava, it dripped and swirled around her ears, down her back and around her sides. The angry burn tracks showed she must have been trustingly seated AT THE FEET of her twisted friend... the "friend" who then doused her with boiling water and dumped her in a lonely ditch. For Phoenix, to rise from cruelty's ashes would require thousands of dollars in urgent round-the-clock care, antibiotics, heavy pain relievers, and a patient, long term recovery. And then... Phoenix was adopted. Phoenix in her forever home! Donations from people like you covered it ALL. You gave our Phoenix wings to fly. Thank you!